No visit to the Margaret River region would be complete without at least one lunch at one of our region’s fabulous winery restaurants. There’s nothing the Margaret River Discovery Co enjoys more than a looooong Sunday lunch overlooking the vines! More and more restaurants are appearing in the Capes region but the best ones are still regularly fully booked, so if you are travelling from afar and don’t want to miss your first choice, I’d suggest making your restaurant bookings once you have confirmed your accommodation. The dilemma becomes which one of the many to book. To help you choose, we at the Margaret River Discovery Co. have embarked on the terribly arduous task of dining at all of them and now suggest to you our absolute favourites. But lets just say the lunch we love the most is considered the most exclusive lunch experience in the region. Limited to only six guests, you really need to plan ahead if you want to book a table at this place. There’s only one table! It doesn’t get more authentic or real than the Margaret River Discovery Tour lunch. 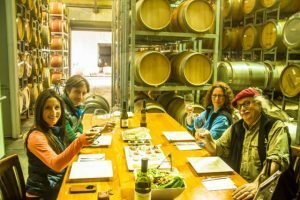 This includes a very genuine lunch experience among the barrels or in the vineyards at Fraser Gallop Estate. The lunch features a selection of the best local produce sourced from the best producers in the region. 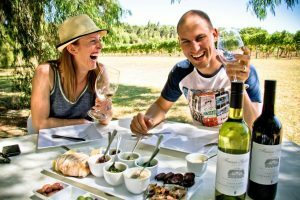 This is the perfect balance of a genuine wine industry locals lunch on one day and a fancy Margaret River winery lunch on another day. And the best of the rest, in no particular order! Consistently one of the best. The restaurant at Vasse Felix is on the second floor of the cellar door building and looks out over some of the oldest vines in the Margaret River region. The kitchen serves everything from the full degustation experience to a cheese or charcuterie plate. The hottest restaurant in the region right now with Blair and Renee Allen running the show. A stylish new addition to the Caves road winery strip, Amelia Park is set to become a favourite for locals and visitors alike. Stunning food inside (Lamb Shoulder for two is the BEST!) and a stunning view across the vineyard. The menu at Rustico is on par with the other traditional Margaret River winery restaurants but the setting is more relaxed and the kids can go nuts on the lawn overlooking the vineyards. Tapas style dishes are designed to be shared and the degustation menu is the bargain of the region. Awesome value and great food. You can completely write the afternoon off here! Save your appetite for your lunch at Voyager, which offers the Discovery Menu in either four or six courses. There is no ala carte. Prepare your senses for much oohing and ahhhing. Estate is famous for its annual concert series, Art series wines and never-to-disappoint restaurant menu. The Margaret River Discovery Co. rates this one so highly we had our wedding lunch there! Cullen is famed for its biodynamic wines and the same philosophy extends to the restaurant. You might see the chef dashing from the kitchen to the garden to harvest some fresh produce for your meal. Nothing better than sitting on the deck on Sunday arvo reading the paper, lazy lunch and glass of Semillon in hand. Wills Domain is famous for its tasting menu (which must be booked in advance). These guys have been consistently awesome for several years now. Super relaxed vibe with world class dining experience. This place is a bit of a locals secret. We don’t necessarily want everyone to know because we want to keep it all to ourselves! You feel like you’re disappearing into the bush down a long gravel track but then rewarded by discovering a stellar restaurant experience. Executive Chef Evan Hayter is at the top of his game. Top bloke and sourcing produce directly from the surrounding property. Ok so this is a wild card entry in the Top 10. The “Tav”, is definitely NOT a winery restaurant, but this place is another must do on the Margaret River wine and dine scene. One of the best wine lists in Australia with a stellar selection of local producers, including lots of small winemakers that don’t have cellar door outlets, matched with great aussie pub food. These guys specialise in BBQ! The latest and greatest new restaurant opening since we wrote this list is the new Yarri Restaurant in Dunsborough. Not exactly a winery restaurant, but this beautiful new venue pairs Aaron Carr’s (ex Vasse Felix Executive Chef) delicious take on modern Australian food with wines from South West winemaker Snake + Herring. The cuisine reflects the six seasons of WA’s Nyungar people and country, and the ingredients are sustainably sourced from the region and beyond. In a word – AWESOME. Easiest accessed from Dunsborough, Busselton or Yallingup. Allow a minimum of one hour drive time from Margaret River accommodation. If you want to book the Margaret River Discovery Tour lunch, we recommend booking early in your stay so you get the most out of your holiday. We’ll also help set you up with a few tips and recommendations for they remaining days or your holiday. The tour tends to sell out a few weeks in advance, especially in peak season, so we suggest to plan ahead as far as possible.